Every year the IL Indoor writing staff submit their picks for the annual NLL awards, and here are mine. Note that these are not picks for who I think will win, they’re picks for who I think should win. Billings had almost as great a season in 2013 as he did in 2012, and Duch set personal records in both goals (leading the league) and assists. Crawford only had 4 games (out of 14) with less than 6 points – none of them after March 3 – and had six straight games of 8+ points. But Evans had them all beat before he even began his final game. Evans had five games with 10+ points, more than John Grant had during his record-setting 2012 season, while only Crawford and Dan Dawson even had two. Is this a bit of a homer pick? Possibly, but I really thought Gamble had a hell of a year. He played strong defense, ran like the wind, scored a bunch of goals (including two on the power-play), and led the team in loose balls. I thought about picking Jordan MacIntosh, who will probably win the award, but decided against it for the same reason I didn’t think Jeff Shattler should have won this award two years ago – he’s not really a transition player. He’s an excellent player, no question, and as good as he was, he even stepped up his game when Andrew Suitor went down with a season-ending injury. But he played a lot more shifts on offense than he did defense. In the division semi-final game, MacIntosh played as much offense as Benesch or Crawford did. Gamble is a true transition player. It sounds like Kyle Rubisch might be the winner of this award every year for the foreseeable future. The word I hear most often to describe his play is “beast”. If not for Matt Vinc, the Knighthawks might have been hitting the links early, not the Bandits. To have a goalie with the best GAA and the best save percentage in the league and still finish at .500 tells you how bad their offense was. Similarly, as one Wings fan put it, the Wings would be 1-15 without Brandon Miller. I’m not sure it would have been that bad but the Wings had a similar problem to the Knighthawks – outstanding goaltending, but almost no offense to speak of. From a stats point of view, it was closer than you might have thought. Matthews had 4.31 points per game, while Jackson and Matisz had 4.00 and 3.94 respectively. But Matthews turned the Rush’s mediocre offense from last year into the third highest-scoring in the league, and that’s after losing Aaron Wilson, Scott Evans, and Shawn Williams. Obviously Matthews himself didn’t make up the difference entirely, but he forced opposing defenses to focus on him. This opened things up for Ryan Ward, Corey Small, and Zack Greer, all of whom increased their point totals over 2012. When you think of the offensive stars on the Knighthawks, you think Jamieson, Dawson, Powless, Accursi, Point, even Keogh, but Vitarelli doesn’t always spring to mind. But he was third in team scoring, put up at least a point in every game he played this year, and scored some of the prettiest goals we saw all season. Beirnes has gotten more recognition in the last year or two for his hard work playing behind big-name guys like Doyle, Billings, and Sanderson, but he’s been doing that for years. Jay Thorimbert had almost identical face-off numbers to Bob Snider, which is impressive in itself. 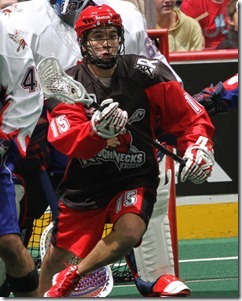 Thorimbert split face-off duties in 2012 with Brandon Francis and Jeremy Thompson, but became the Bandits’ only face-off man this year – and increased their team face-off win percentage from 48.3% to 59.7%. Brodie MacDonald only played in three games this year, but put in at least 20 minutes in each, and finished with a GAA of around 8 and a save percentage of 80%. Having that kind of backup goalie behind you has to be a great confidence boost for both Aaron Bold and Derek Keenan. The Rock were the most consistent team this year, in a league where many teams looked unstoppable one week and terrible the next. Chris Hall showed how important he is to the Stealth, bringing them back from their brutal 2012 season, much of which was played without him, to second place in the West. Drafting Mark Matthews wasn’t the master stroke – every GM would have done that. But in the off-season, Keenan retooled the offense, turning them from the worst in the league to the third-highest scoring – and managed to do this despite losing Shawn Williams, Aaron Wilson, and Scott Evans. Keenan also turned Paul Rabil, a player who never played for him and wasn’t going to, into Jarrett Davis. Evans had an outstanding year. He led the league in both assists and points, almost setting records in both, and beat his next closest teammate by almost fifty points. He had almost exactly the season Garrett Billings had a year ago, and Billings was my choice for MVP then. How close were their seasons? Evans had the same number of goals as he did last season but picked up 33 more assists. Just to cap it all off, Evans scored the overtime winner in the last game of the season to clinch the Western division for the Roughnecks. I went 2-2 in the final week of the season, bringing me to 33-39. Not bad, better than last year, but still not up to the level of my IL Indoor colleagues, all but one of whom finished at or above .500. Only Ty Pilson finished with a losing record, and he was still two games ahead of me. I will need to step up my “make wild guesses” game. What better way to do that than with four games that could easily go either way? I really should be used to that since that’s been the case in the NLL pretty much all season long. PHI @ ROC Which Rochester team shows up? The one that scored 20 against Philly and then 15 against Buffalo the next night, or the one that 14 total against Buffalo and Philly over the next two weeks? I’m gonna say neither since I don’t see this being a high-scoring game, but I think Rochester will win it. The Knighthawks offense started to play better once they traded Casey Powell and while both goalies can steal a game, Vinc is my choice for Goaltender of the Year. COL @ CAL Tye Belanger does seem to be the real deal in net, but it’s his first season. I honestly don’t know if “playoff experience” is a real thing that actually affects how you play, but lots of people seem to think so, and Tye doesn’t have any of it. 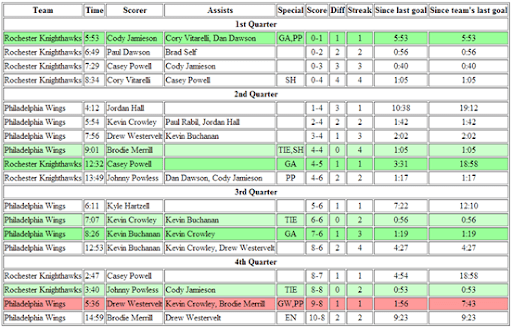 That said, the Roughnecks might be without Dane Dobbie and Scott Ranger. It’s not like there’s nobody else on Calgary that can score, but it puts a lot more pressure on Dickson, Shattler, and Veltman to produce. MIN @ TOR Of all the teams Toronto could have faced in the first round of the playoffs, Minnesota would have been last on my list of preferences. The two teams played twice this year, each team winning 13-12 at home. Nick Rose better have a good night though, since we’ve seen that the Swarm can have an explosive offense, particularly Callum Crawford. Tyler Carlson is another potential game-stealer. I’m still going with the Rock, but this will be a tough win. Understatement of the week: The fact that eight of the nine NLL teams make the playoffs has caused some controversy. Judging by the talk on twitter and the IL Indoor forums over the last year or two, many fans don’t like it. They feel it cheapens the regular season, making most of the games meaningless. As someone put it, they play 72 games to eliminate 1 team, then 7 games to eliminate 7 teams. The more teams make the playoffs, the more fans get to watch playoff games, and who doesn’t want to watch their team in playoff games? More teams in the playoffs means more playoff games. More playoff games means more revenue. Now that the NLL is actually receiving money from a TV deal (CBS Sports), this is a good thing for the league. Unless a team has a really lousy season, every team is still in the playoff hunt until close to the end of the season, arguably making more games meaningful, not fewer. This year, with only four games left in the regular season, we only know the final seeding of one team, and three teams are still fighting for two remaining playoff spots. If you’re a good team and you’re confident you won’t finish last, you could mail in the first half of the season, knowing you’d still make the playoffs anyway. As long as you don’t finish last, the regular season is basically a warm-up for the playoffs. If two teams have a really lousy season, you could have a 5-11 team make the playoffs. And we have. For comparison, this is equivalent to 51 points in a full NHL season. The fewest points by a playoff team since the 2004-05 lockout was 88 by both Philadelphia and Montreal in 2009-10 – and many think the NHL also allows too many teams into the playoffs. Con #2 is certainly an issue that I agree with. No team with a record that bad should be making the playoffs. But I’m not sure I buy Con #1. First off, if you make the playoffs but don’t finish first or second, you may not get a home playoff game, and I assume teams generally want to play playoff games at home. So simply making the playoffs isn’t enough. Also, if you mail in the first half and then screw up the second half and do miss the playoffs, you’re going to look pretty stupid. A stupid move like that is likely to cost you (as a coach or GM) your job, and in this league, it could cost you your fan base and ultimately your franchise. No executive is going to take that chance. Nuke the divisional format and just have nine teams, ranked 1-9. Top six make the playoffs. In the first round, the top 2 teams get a bye, 3 plays 6 and 4 plays 5. Then 1 plays lowest seeded winner and 2 plays higher seeded winner. Winners of those games play for the Cup. If we must have divisions, then the top 3 from each division make the playoffs. No crossover. Top two get a bye, 2 and 3 in each division play. 1 plays winner, division winners play for the Cup. Either way, we have five playoff games instead of seven, so the league may not like that. But the drama this weekend notwithstanding, it would make the regular season in general more meaningful, and reduces the possibility of a crappy team making the playoffs only because another team is crappier. Of course, to go along with this would be a balanced schedule – but that’s a whole ‘nother topic for another day.